Just finished a great initiative for Medicare Local in the Northern Territory. 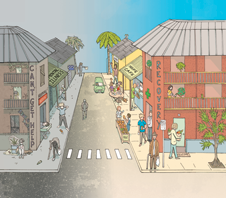 Boab Design commissioned two illustrations, one urban, the other specifically tailored for the indigenous community. They had to reference the place, but be anonymous enough that a wide range of people could relate to the image; while also including very specific details from Medicare. Each state has its own version of the program, but for the diverse NT, Boab boldly – and effectively – chose to use illustration rather than a generic stock photo. Resulting promotional campaign is strong and stands out. Really pleased to have been involved.